Our range of products include stage scissor lift, zero scissor lift, battery operated scissor lift table, multi scissor lifts, scissor lift and single scissor lift. 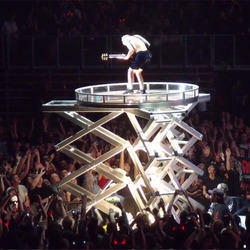 For the world's most influential performers, no act is complete without Stage Scissor Lift. They are essential for creating exciting effects and dramatic reveals by lifting artists, band gear, and props. NANDAN offers large range of All Access Stage Scissor Lift (Stage Lifts for underground access) with personalization of rotating platforms. Nandan manufactures a variety of (Low Height Scissor Lifts) Zero Scissor Lift which are used for the loading of the trucks. The minimum height of just about 50mm ensures ease of loading. It can be also designed to be robust enough for putting a forklift onto the container. Nandan’s Battery Operated Scissor Lift Table can be designed for your unique application and is manufactured using our standard 4:1 safety factor using heavy duty components throughout the unit, which allows for standard capacities up to 25 ton. 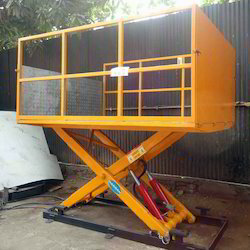 NANDAN is leading manufacturer & supplier of Multi Scissor Lifts with traction for overheard electrical works, fixing of ac ducts, and maintenance of tall equipments. Abdicated using quality raw material, the lift is precision designed, easy in operation and provides an optimum performance. 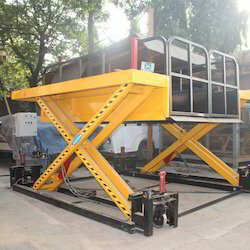 NANDAN is well known for the unique solutions in customizations through our own application engineers who can tailor make a scissor lift to your specifications. 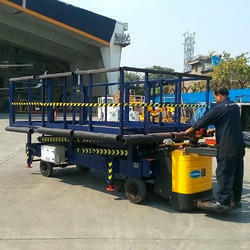 Nandan's Tandem Configuration Scissor Lift is ideal for handling long and heavy loads. 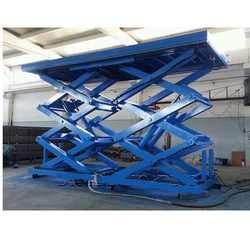 The back to back set of scissor arms gives the scissor lift the stability to handle several types of loads. A load may include heavy equipment, automotive assemblies, wood, furniture and other longer loads. 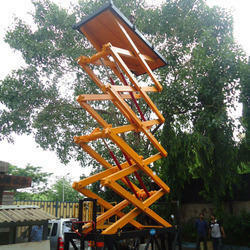 The NANDAN's Single Scissor Lift comes in a wide variety of sizes and weight capacities, We are one of the renowned manufacturers and exporters of Single Scissor Lift that finds it applications in diverse applications like car lifts, painting booth add-ons, welding automation, in-plant product storage and transfer, dock lifts and freight lifts. It is designed with high quality standardized material which provides an innovative and cost effective lifting solution. Smooth lifting up and down, optimized powerpack, pilot check valves on the cylinders are some of the USPs which makes it unique from others.